One of the many struggles of every baseball team in the major leagues is to balance the desire to win now and the desire to win in the future. That’s why we have arguments every April about reforming the arbitration system, why teams agonize over trade deadline decisions, and why we talk about pitcher workloads toward the end of each season. We want young, exciting players to be on the field as much as possible. Due to long-term team interests, that doesn’t always happen. Usually, paying too much attention to word choice in manager interviews is a pointless exercise, but when the greatest strength of a team – its young, dominant starting pitching – is publicly called into question by the team’s manager, it’s at the very least something to pay attention to. The concern over “the wall” that Collins has been voicing in relation to his young starters is merited. Harvey is coming off a Game One start in which he had some of the worst stuff of his career. And, despite deGrom’s healthy velocity during Game Two (his average fastball was 95.5 mph, not far from his regular season average of 95.8 mph), fatigue doesn’t affect every pitcher’s game in the same way. 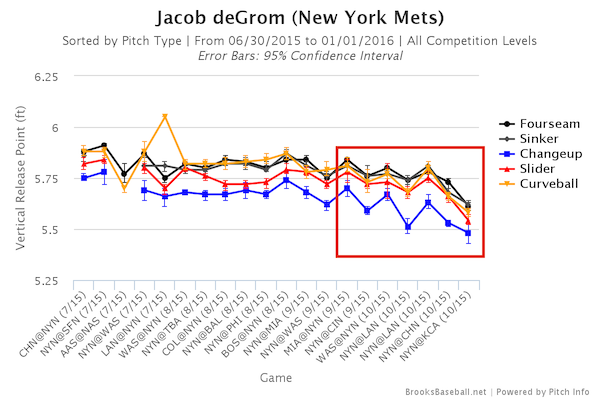 There are many indicators, as we’ll see below, that suggest deGrom hasn’t quite been himself in his past few starts. Let’s start by looking at workload changes. The frame for this issue should not necessarily be that deGrom has thrown too many innings, but rather that he’s thrown more innings than he is used to. deGrom has thrown 3,395 pitches this season, including the playoffs. Madison Bumgarner threw 4,074 last season — which is to say, many more. It isn’t so much that deGrom doesn’t have the arm that Bumgarner does — that is impossible to say — but rather that he’s in uncharted waters. He’s never thrown this many innings, and because of that, the way his arm responds to the workload is completely unknown. We’re starting to get an idea of the way it is responding, however. Last year, deGrom threw 178.2 combined innings between the minor leagues and the majors. This year, including the playoffs, he’s at 216.0. It might be best to use total pitches between the years, but that data isn’t readily available (at least for the minor leagues), so this is the best we have — and an increase of 37.1 innings is not unsubstantial. Let’s pinpoint where deGrom passed his 2014 innings-pitched mark this season and look at results before and after that point. He pitched 191 innings this regular season, so deduct 178.2 from that and we have 12.1 IP. Looking at his game log, he pitch 15 innings in his last three starts, so let’s go ahead and call that a wash, marking September 9th (vs. the Nationals) as the final start in his “charted” zone. deGrom is showing the lowest sustained zone rate of his career during the stretch of games that has followed his previous career-high point in innings pitched. Some of the variability in the highlighted period is the result of his starts being further apart than usual (he was skipped in the rotation during the final month of the regular season), but he’s still showing a lower zone rate and greater variability than at any point since his call up. The whiff rates on some of his offspeed pitches have actually gone up — his changeup and slider have posted better whiff rates than earlier in the season. However, it’s the four-seam fastball performance that’s been the real issue, as we can see in the whiff rate and batted ball output. All of his pitches have posted lower ground ball rates after 9/9, and most have been hit with more authority — especially the four-seam fastball and the slider, his two main pitches. deGrom probably isn’t injured, as his velocity is right in line with his average for the year. However, we’re seeing indicators that he’s responding with more inconsistency to a workload that he’s never experienced before. That’s not unexpected, mostly because there were no expectations as to how he would handle this vastly increased innings tally. Anyone might respond the same to such an increase, only deGrom is one of the best young pitchers in the game, and he’s currently in the World Series. He might say he isn’t feeling any fatigue, and that might honestly be the case. However, fatigue impacts everyone differently, and sometimes it isn’t just about the radar gun. He might not feel any different, but he’s pitching differently. He’s more erratic with his location, his release point is lower and more inconsistent, and his pitches are getting hit harder. Maybe if this was in the middle of the season we’d say he’s just going through a rough patch. But now, in uncharted territory regarding his workload during the biggest series of his life, he might actually be hitting a wall. We hoped you liked reading Jacob deGrom and Hitting the Wall by Owen Watson! Is Baseball Bad at Bunting? This game wasn’t much different that Game 5 against the Dodgers. The dodgers just didn’t make him pay for his mistakes in that game. He did seem to pitch better against the Cubs.